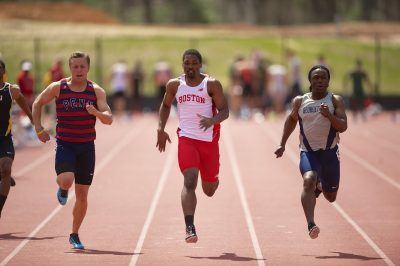 Over the weekend, Boston University track and field teams hosted an invitational, featuring early 3,000 student-athletes from 80 universities. The women’s 4×400-meter relay team placed first in a field of 31 teams with a time of 3:47.42. The team is made up of junior Ayodele Adesanya, senior Djenne Parris, freshman Leah Fowlkes and graduate-student Christy Wood. Adesanya continued her winning ways in individual competitions, placing first in the 500-meter dash among a field of 52 runners with a time of 1:15.01. Sophomore Courtney Breiner also found individual success, running her personal best 1-mile time at 4:56.01. Senior Toria Levy was the only Terrier with a top five finish in hurdles, placing fourth with a time of 8.78 in 60-meter hurdles. Sophomore Kennedy Jones made noticeable improvements over the weekend, finishing third in the triple jump with a 11.83-meter effort. She also placed 18th in the women’s 60-meter hurdles with a time of 9.20. The men also had standout performances over the weekend, notably from senior Ethan Homan. The Scottsdale, Arizona native placed 5th in the men’s one-mile run with a time of 4:00.08. This mark is the ninth fastest time in the nation this season and stands as Homan’s personal best. Senior All-American Cameron Williams finished third in the 200-meter dash with a time of 20.96 seconds. Williams holds the Terrier record in the 200-meter dash, set last year with a time of 20.58. In addition, freshman Johnathon Kemps set his personal best in the 1-mile competition with a time of 4:09.94. Junior Jordan Love finished seventh in the 60-meter dash with a time of 6.92 seconds, just missing her personal best of 6.90. In the field, freshman Clint Lockwood recorded a weight throw of 12.91 meters, good enough for second in the event. Both the men’s and women’s track and field teams will resume action in the Scarlet and White invitational next weekend at the Track and Tennis Center. Both men’s and women’s diving teams swept their opponents this past weekend, as both defeated Boston College and Bryant University. The men defeated BC 155-144, while the women won 177-118. Against Boston College, sophomore Julimar Avila placed first in the 50-meter free (23.85), 100-meter free (51.55) and 100-meter fly (56:05). For the men, sophomore Trevor Winans had another standout performance, placing first in the 100-meter free (45.70), 200-meter free (1:38.27) and second in the 500-meter free (4:37.25). Both men’s and women’s swimming and diving will return to action next week on Feb. 4 at the University of Connecticut.